Sellers and Bidders simply make phone calls or send fax as well as email and we will come to you. For Sellers, our experts will appraise your equipment on site and recommend repairs or upgrades to give you maximum returns for your asssets. Bidders just have to attend the auction site and do the inspection prior to the Auction Day. All purchases will be made in US Dollars. No commission is due by the purchaser of equipment at the Auction. 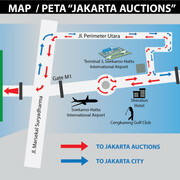 Since the Auction is unreserved, there is no minimum bid for the item(s)/Lot(s). The Auctioneer will be decide the commencing price. However, the final sale price will depend on the highest bid from the Bidders. The Auctioneer will continuously call two amounts (for instance US$ 1,000 & US$ 1,500). The Higher amount is the amount the Auctioneers is asking for, while the lower amount is the amount of the highest bid already made buy a bidder. The process will continue until there is no further bidding, and the item will be sold to the highest bidder. Individual invoice for each item sold will immediately be brought to the successful Bidder/Buyer for his/her signature. A copy will be given to the winning bidder for his/here retention, and Bidder/Buyer is required to produce their invoice copies at the Registration Office for settlement of payment. Throughout the Auction, a digital display will show the asking price the Auctioneer is requesting for the next bid on the Lot currently being sold. Bidders who wish to place a bid for any LOT(s) are kindly requested to raise their hand, holding the Bidder's book, and in the case of such bidder securing the highest bid. The Auctioneer will then announce his Bid Book/Buyer's Number as the winner of the LOT. At any time during the Auction, the Auctioneer may, at its own discretion, offer to sell one individual Lot/Item, or a group of items. Jakarta Auctions provide the maximum services to the Consignors who are looking for selling their equipment thru Auction and turn the assets into quick cash. We do the appraisal on the equipment that gives the prospective consignor an estimate of the value of the appraised equipment. In the matter on consigning equipment, our expert will do advice to the Prospective Consignors if the equipment are needed to be repaired or upgraded those will bring a maximum returns for your assets. For further information of the Consignment or to get a complete Auction Agreement and complete Terms and Conditions of auction, please contact one of our Sales People. Prospective bidders are required to register prior to bidding. A bidding book is required in order to bid on any lot in the Auction. A bidding book may be obtained by completing the Application Form provided by the Auctioneers. An applicant must provide identification (I.D., Driver license, and/or Passport). A deposit will be required for registration of no less than $ 17,500 US Dollars cash, and or the equivalent in Indonesian Rupiah cash, or by transfer where the Deposit has been received by the Auctioneer prior to issuance of the bidder's book. Deposits will be refunded for those who have registered but made no purchase at the Auction. A successful Bidder shall pay the Auctioneers in cash (or in a manner which Auctioneers agree), the purchase price of each Lot purchased in the following manner: 25% of the purchase price, or US$ 17,500, whichever amount is higher, shall be paid on the date of the Auction, and the balance shall be paid within 7 days after the date of the Auction. No Item purchased maybe removed from the Auction site until full payment is received or until personal/company cheque have been cleared by the bank. Our staff will be available on the sale days to guide you in the transfer of funds.